A hybrid mattress is very simply, a mattress made with (at least) two different types of materials. And in some cases, it means you reap the benefits of all those materials too. Traditionally, a hybrid mattress referred to a mattress made up of memory foam and innerspring coils. But now, mattress companies are getting a little more creative. 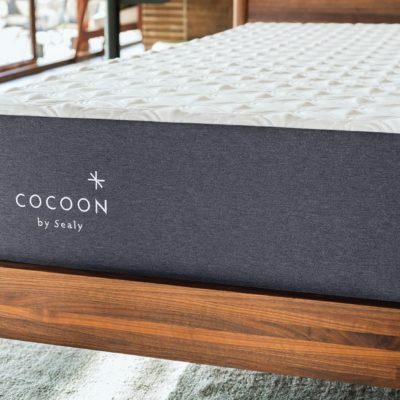 Of the mattresses we’ve reviewed here, you’ll see foam + coils; coils + pillow-top; latex + coils, hyper-elastic polymer + foam; and even foam + latex + coils. You might already be convinced that a hybrid mattress is right for you. If that’s the case, then hop over here to check out our favorite hybrid mattress brands. If you still need some persuading, then stick around and we’ll help you decide if it’s time to go hybrid. If you’re a sleeper who’s not completely satisfied with what an innerspring or foam mattress has to offer, then a hybrid mattress might be best for you. When you’re spending almost a third of your life in a mattress, it’s ok to feel like you shouldn’t have to compromise. 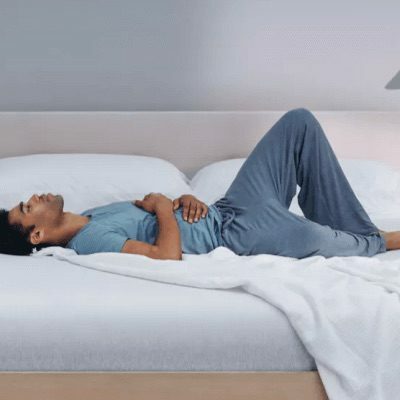 Hybrid mattresses, in the traditional sense, aim to combine the benefits of a coil mattress (support and bounce) with the benefits of a memory foam mattress (body contouring, pressure relief and motion isolation). When you add latex to the mix, you’re adding cooling properties and durability too. 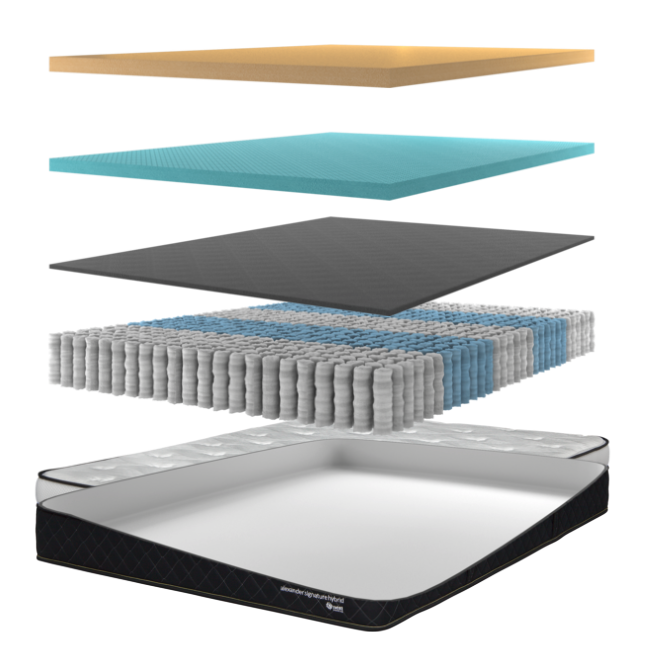 The combination of materials in a hybrid mattress also tend to alleviate some of the negative characteristics that these materials might have on their own. For example, motion transfer will be better on a hybrid than innerspring alone with the help of more motion-absorbing layers. If you and your sleeping partner want different things in a mattress, then a hybrid might be the best option for you. (It’s a lot cheaper than counseling, trust us.) 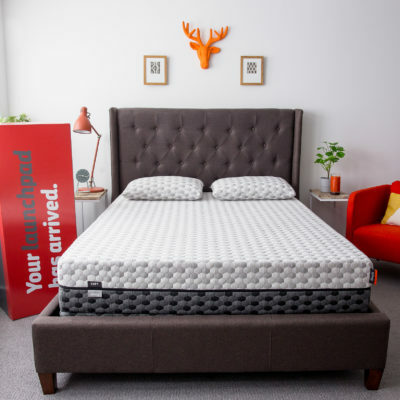 It’s also worth noting that five of the seven hybrid mattresses we’ve reviewed below offer different levels of firmness for you to choose from. 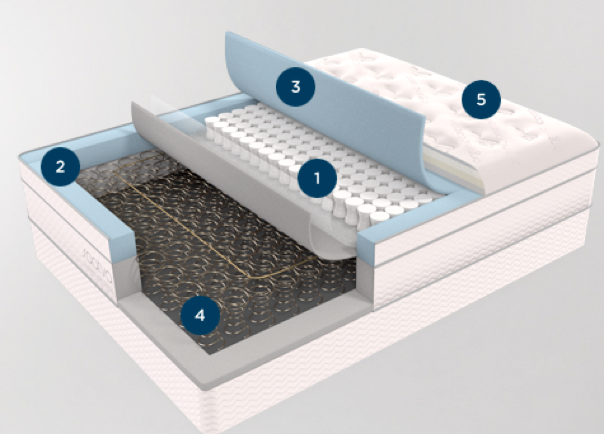 The Helix mattress even allows you to customize the entire bed or individual sides of the bed. If you and your sleeping partner want different things in a mattress, then a hybrid might be the best option for you. Getting the best of both worlds (or three worlds in some cases…) usually means a higher price tag. Hybrid mattresses can range from $1,000 – $1,500, compared to memory foam mattresses which can range from $675 – $1,100. Hybrid mattresses can also be extremely heavy, making transporting and handling challenging. You’ll definitely need a buddy to help you carry the mattress (even when it’s in the box) and set it up. But the bad news aside, we still think hybrid mattresses are pretty great. 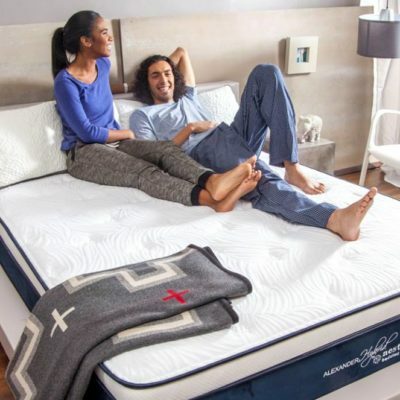 And consumers agree: the overall satisfaction level among hybrid mattress owners is 81%. If you think it’s time to add yourself to that category, then take a look at our favorite hybrid mattresses below. Here we’ve highlighted some of the factors that might help you determine which hybrid mattress will be best for you. We consider these the top-rated mattresses based on quality, overall value and convenience. You’ll see them listed from least to most expensive. Pay attention to factors that might be important to you – like support, firmness, cooling properties, trial period and price. If you want to know more about any of these brands, you can read more about why we like them, what customers have to say, and all the important details in the section right below this chart. * Price for a queen size mattress. We like the Helix mattress because it truly is a bed that’s made for you – factoring in your size and preferences. If you and your sleeping partner have different needs, then we recommend giving the Helix mattress a try. 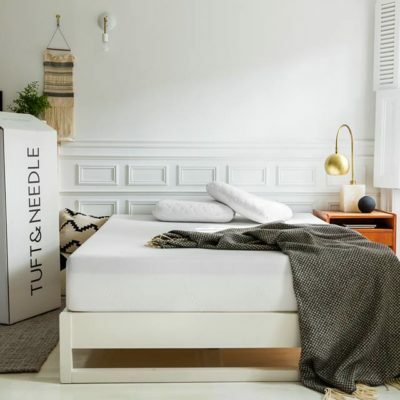 We also like how simple the “customize your own mattress” quiz is – they don’t use any fancy mattress lingo – just straightforward terms that you’ll understand to help build the best mattress for you. 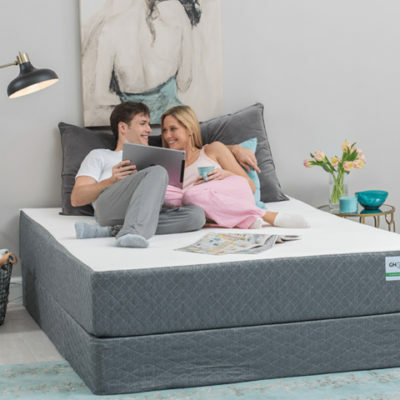 If you’re sharing the Helix with a sleeping partner, you will have the option to build a blended mattress (which combines both test results across the entire mattress) or dual comfort (which personalizes each side of the bed based on test results). If you opt for the dual comfort option, be aware that this will add $150 to your total, along with an extra 2-3 days in shipping time. 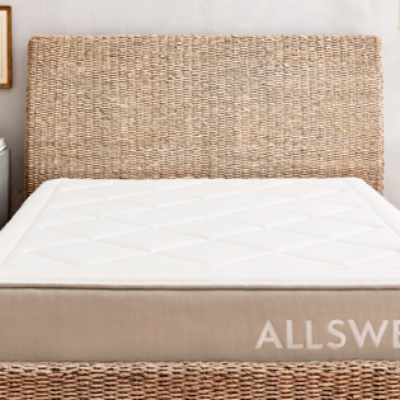 “We LOVE our Helix mattress! My husband prefers for his to be more firm and I like it a bit softer and that was always tricky for us. Now, no problem at all! 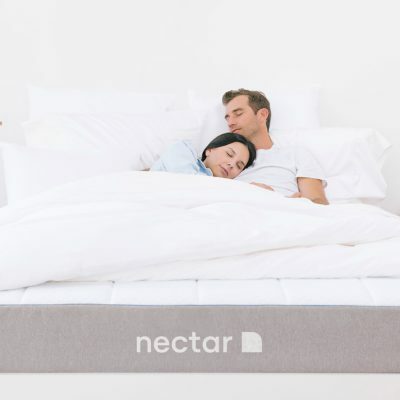 We sleep like babies.” – Viktoriya K.
“I got the Helix after trying out a competitor’s mattress. This is the best mattress that I have slept on. Great support, cool sleeping temp, and very comfortable. I would recommend this mattress to anyone looking for the complete package.” – Bill B. Delivery: The Helix mattress ships free in the U.S. and usually takes 6-10 business days. If you choose the dual comfort option, this will add another 2-3 days to the shipping timeline. Setup: Once your Helix arrives, simply remove the mattress from the box and set it on your foundation while it’s still encased in plastic. Then, remove the mattress from its plastic wrapping, give it 45 minutes to an hour to regain its shape. Foundation: Works with most foundations and frames but is most compatible with flat surfaces because it is still a foam mattress. Return policy: If you are unhappy with your Helix mattress within the first 100 days, you can return it for a full refund. Helix will make every effort to donate lightly used mattresses to charities and housing facilities. Helix also offers a mattress foundation designed specifically to support the Helix mattress ($275 for queen) and a mattress protector ($90 for queen). 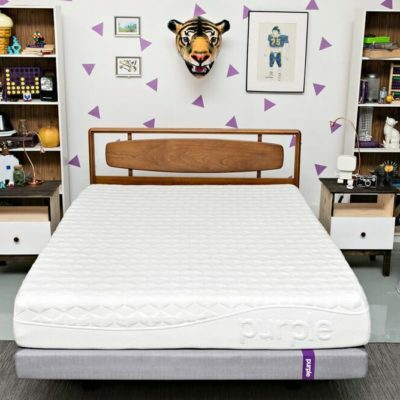 The Purple is a mattress with a big personality, but it does have a lot to boast about: it sleeps super cool, is great for spinal alignment and does a good job with reducing any movement you’ll feel from other people (or animals). Customers who own the Purple have claimed it’s helped them relieve back and neck pains. The Purple is topped with a unique pressure-releasing material that is especially great for back and side sleepers – when you lie on your back, it will help your spine maintain its natural curve and when you lie on your side, it will help keep your spine straight. “It’s the best mattress I’ve ever used. I thought it was pricey at first, but it is worth every coin and every dollar! I broke my back around 2 years ago and still have some pretty bad pain where I broke it, but Purple has actually decreased the pain which is amazing! My mother has the mattress and actually was the one who recommended it to me after I got out of the hospital.” – Rachel C.
What’s inside: The Purple mattress is made with a layer of hyper-elastic polymer (designed to keep you cool and provide great pressure relief) on top of two layers of high-density polyurethane foam (designed for durability, support and motion isolation).The cover is made with a blend of viscose, polyester, and polyester-lycra (designed for maximum breathability and a soft, stretchy surface). Delivery: The Purple ships free within the lower 48 states and typically arrives within 4-7 business days. Setup: The Purple mattress comes rolled and in a cylinder case. You will simply open the casing, unroll it on your foundation (if you’re using one), and it will be ready to use right away. Watch this video to see how it’s done. Foundation: The Purple just needs a sturdy surface to sit on, whether that’s a platform, slats (3″ apart or less), box foundation, an adjustable bed frame, or even the floor. Return policy: If you decide the Purple is not for you within the 100-day trial period, you can return it for a full refund. They will come pick up your mattress and donate it to a local charity at no cost. Purple does ask that you try your mattress for at least 30 days. Purple also sells seat cushions, a pillow ($99), platform base ($174 for queen), sheets ($114 for queen), a mattress protector ($59 for queen) and adjustable base ($1,500 for queen). So you can go to town on a whole new set-up. There are also bundle discounts available on certain product combos. 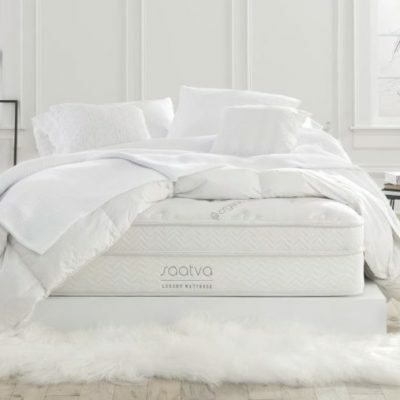 Saatva is one of those mattresses that has all the bells and whistles: it’s customizable, made with quality materials and it’s eco-friendly (although not 100% green). This mattress is known for having great edge support, lumbar support and pressure relief. Saatva comes with free white-glove delivery, setup and mattress removal, but if you decide to return the mattress, there is a non-refundable handling fee of $99. What’s inside: The Saatva has a lot going on inside: there are 5 different premium material layers that make up the mattress including a coil on coil construction, memory foam and a euro pillow-top. You also have the option of choosing plush soft, luxury firm or firm. Delivery: Delivery of the Saatva mattress can take up to 15 days, but it comes with free white-glove delivery and set-up. Saatva will also remove your old mattress at no cost if you have one to get rid of. Setup: The Saatva delivery team will unbox and assemble your purchase in the room of your choice. They will also remove your old mattress and foundation for an additional $39. Foundation: If your box spring/foundation is in very good condition, meaning it’s sturdy and has absolutely no sagging, it should work fine with the Saatva mattress. Your mattress warranty remains in place even when using your own foundation/ box spring, although Saatva does sell one themselves. Return policy: If you decide the Saatva is not right for you within your 120-day home trial period, it can be returned for a full and prompt refund of the purchase price, less a $99 handling fee. Saatva also offers an adjustable base called The Lineal ($1,399 for queen), and an additional foundation or stationary frame ($250 for queen foundation / $99 for queen frame). The Alexander Signature Hybrid made of four premium layers, including foam and pocket coils – which offer great cooling properties, comfort and edge support. You do have a choice between Plush, Medium and Luxury Firm with this mattress. 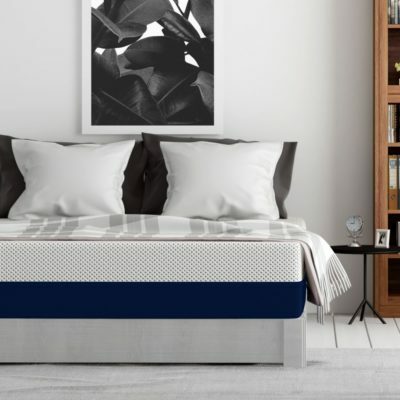 Another factor to consider is that Nest Bedding offers six different types of mattresses, so if the Alexander Signature Hybrid doesn’t end up working for you, they’ll help you easily exchange it for one of their other mattresses. “We debated a long time if we should spend this kind of money on something we have not laid eyes on but took the plunge due to the great reviews. I am so happy we did. My wife and I wear a Fitbit that tracks our sleep. What a difference a mattress makes. We used to wake several times through the night but not anymore. 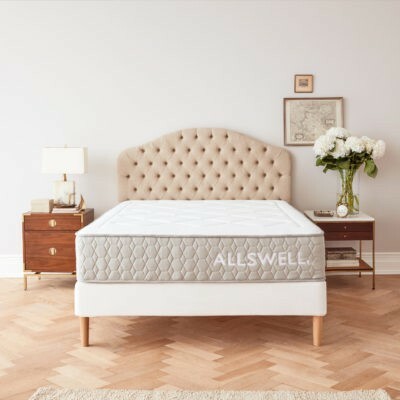 I recommend this mattress to everyone.” – Michael L.
Delivery: The Alexander Signature Hybrid ships free to the lower 48 states and usually arrives within 3-9 business days. Setup: This mattress comes compressed, rolled and boxed. You will simply unbox the mattress, unroll it on your foundation, remove the plastic wrapping and watch it grow. Foundation: The Alexander Signature Hybrid should be used on a non-flexible base. If using slats, you’ll want to make sure they do not bend at all and have good center support. You should not use this mattress on the floor, older style flexible box springs, slats that are flexible or bowed, or slats that are more than 4″ apart. Return policy: If you decide the Alexander Signature Hybrid mattress is not for you after at least 30 nights and within the 100-night trial period, you can either exchange the mattress for another model/feel or return it all together. You can donate your unwanted bed to a local charity and have your original purchase price refunded in full. Nest Bedding sells a number of other sleep accessories including sheets and bedding, foundations, pillows, and bedding products for kids. You can even get a bed for your dog. They also currently offer six different models of mattresses. 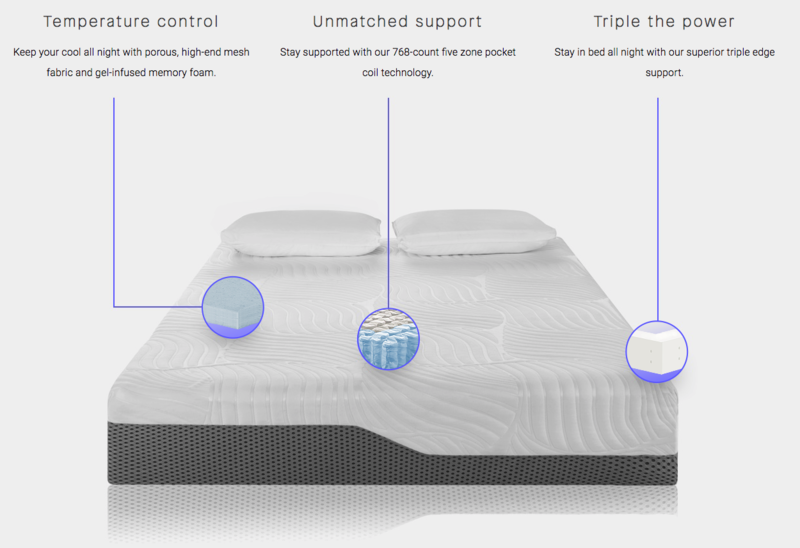 The Voila mattress has 12 layers of memory foam, latex and coils. And while more layers aren’t always better, you’re still reaping lots of benefits from this hybrid mattress. This mattress is the epitome of a hybrid at a reasonable price-point, offering pressure relief, even body weight distribution, limited motion transfer and cooling properties. It also has a triple-layer edge support system, so you couldn’t roll off this bed if you tried. “This mattress offers both firm support and the perfect amount of cushioning on top. We got the plush mattress and we love it. I was worried that it might not be firm enough but it offers great support! I love having a little extra memory foam on top, it makes it easier on aching joints. The mattress is also really pretty with a quilted white top. We are super happy with our Voila mattress!” – Lisa L.
What’s inside: The Voila has 12 (yes, 12) layers of premium gel-infused memory foam, latex, and 768-count five-zone pocket coils. All sizes are available in three different levels of firmness: Plush, Medium and Firm. You can read more about each firmness and which might be best for you here. Delivery: The Voila mattress typically arrives within 3-7 business days. Standard shipping is free but you do have the option to pay for expedited shipping. Setup: This mattress comes compressed, rolled and boxed. You will simply unbox the mattress, unroll it on your foundation, remove the plastic wrapping and watch it grow. See how it comes to life here. Foundation: The Voila works with virtually any bed frame or base. Return policy: If you decide the Voila mattress is not right for you after at least 30 nights and within your 100-night trial window, just let them know and they’ll arrange a free pickup from your home. They’ll also refund your purchase in full. 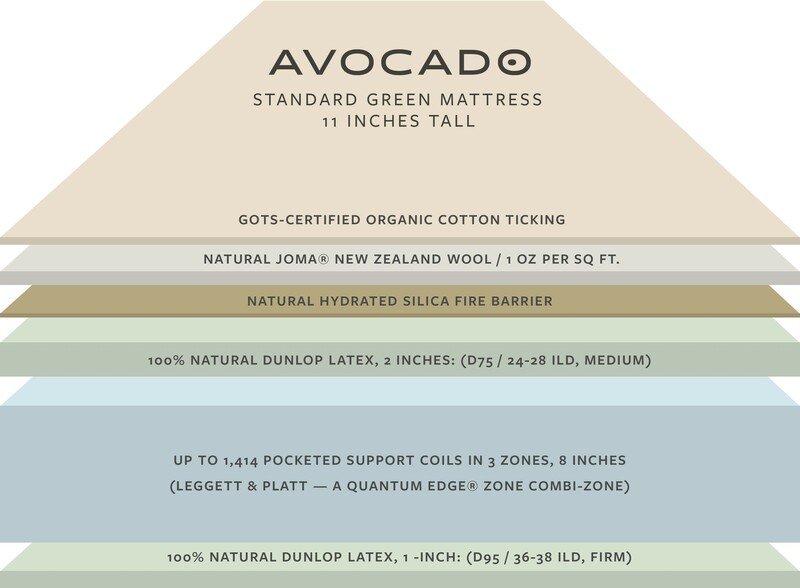 While the Avocado mattress is on the pricier side, you are investing in all-natural materials and a latex/hybrid mattress which is known to have great durability and one of the longest lifespans. The Avocado is one of the greenest mattresses out there – nearly all of the materials in the mattress can be recycled. “It’s been almost a month and we are extremely happy with our Avocado so far! We purchased the standard mattress without the pillow top and it’s the perfect level of firmness for my hubby and I which has proven to be a tough task until now. We tried out two other mattresses from a similar green online mattress company and unfortunately both of them had to be returned due to sagging after less than 6 weeks.” – Kristi K.
“Recently, bought a Queen with plush topper. I found the mattress a bit too firm for me after sleeping on it for a few nights. I got in touch with Jay (Avocado’s customer service person) and, without any hesitation, he proposed that he sent me another (softer) topper. I received the topper within a few days. I am now very happy with my mattress; I am a back- and side-side sleeper and this mattress gives me great neck and back support. Bottom line: Customer Service was exceptional. If ever I need another mattress, I feel I can order from Avocado, knowing that I will be taken care of.” – Michael L.
“We have been sleeping on our new mattress with pillow top for a few weeks now. It is firmer than the old (spring) mattress we previously had and it took me about a week or so to get used to that but now we love it. (My husband liked it immediately.) I especially love it that I do not get woken up anymore every time my husband turns around as the movements on his side of the mattress are hardly noticeable on my side.” – Nicolette H.
What’s inside: The Avocado is made with all natural and organic materials and offers a standard or pillow-top option for all sizes. Side sleepers typically prefer the pillow-top option, while back and stomach sleepers (and those with back pain) tend to find more comfort on the standard mattress. Delivery: The Avocado ships free and is made to order, which takes about 5-7 business days, plus up to 2 weeks to ship your mattress. Setup: The Avocado mattress comes compressed, rolled and boxed. You will simply unbox the mattress, unroll it on your foundation (if you’re using one), remove the plastic wrapping and watch it grow. Avocado will also deliver your new mattress, set it up, and remove your old one for a $99 fee. (Note: the King with pillow-top option requires in-home delivery due to its weight.) You can read more about set-up instructions here. Foundation: A foundation is not required, but if you choose to use one, a box spring or slatted foundation will work fine. Avocado recommends S. Box Spring which makes a natural wood foundation ($215 for queen). Return policy: If you decide the Avocado mattress isn’t right for you within the 100-night trial period, you can arrange a return where they will either recycle the mattress or donate it to a local charity at no cost. You will also get a full refund on your purchase. Avocado also offers a green pillow made with natural latex ($89 for queen). 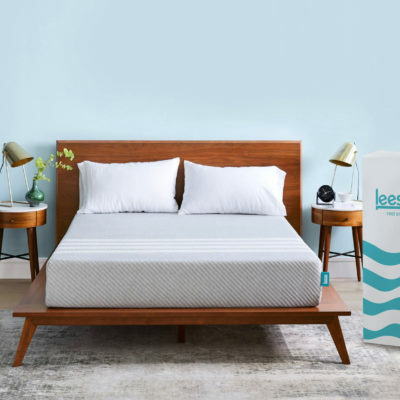 The Sapira mattress is a luxury hybrid option offered by Leesa. This mattress is known for having a very responsive sleep surface that reacts to your body as you move and change positions. Since the Sapira is topped with a layer of foam, you’ll get better motion isolation than an innerspring mattress alone. The coils inside also help provide great edge support. “This mattress is amazing. I was having hip pain and after settling in the first night pain wasn’t as intense. Second night pain was gone. I do recommend getting a hard surface solid base for it. I had put the mattress on my old box spring and the mattress sagged in the middle. 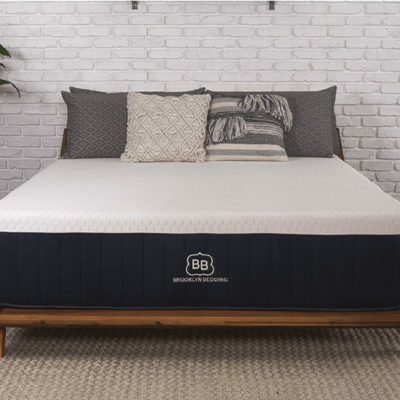 My husband put a large board between the mattress and the box spring and this fixed the sagging, so I do recommend the solid base for it.” – Jenny H.
“The springs give it firmness for heavier bodies unlike Casper and others that just provide strong memory foam layers. We are both overweight (220’s) so we need a bed that won’t lose its firmness when only memory foam sinks down. Yet, it is very comfortable for side-sleepers-maintains vertebra in straight position without compromising good posture. We were comfortable from day one and feel that the bed will last. I have had acute lower back pain and the bed combined with a long side-sleeping pillow has cured my insomnia and pain overnight. Thank you for your innovation, Sapira!” – Emily R.
“This is our third mattress in 3 years, and finally we have a mattress that doesn’t cave in the middle and doesn’t jiggle when one of us gets out of bed in the morning. We also feel it gives us more support for our backs. Couldn’t be happier!” – Jules B. Delivery: The Sapira mattress ships free throughout the entire US and usually arrives at your door in 3-10 business days. 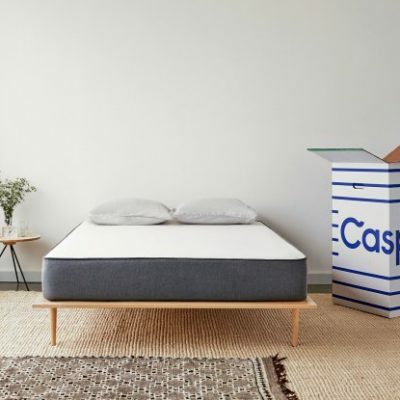 Setup: The Sapira mattress comes compressed, rolled and boxed. You will simply unbox the mattress, unroll it on your foundation, remove the plastic wrapping and watch it grow. Foundation: Sapira recommends a firm, flat, and sturdy surface to place your mattress on. Traditional box springs or flexible slats can make it feel too soft. Solid or slatted bases are best. Hybrid mattresses might seem like they’re too good to be true. But the good news for you is that you can find out for yourself. If a hybrid mattress seems like it might work for you, give it a try. If you still have questions about hybrid mattresses, or you have one that you particularly love, let us know in the comments below.